Missouri politics: Why the swing state is now a red state. For the first time, Democrats aren’t trying to win Missouri’s electoral votes. Why? 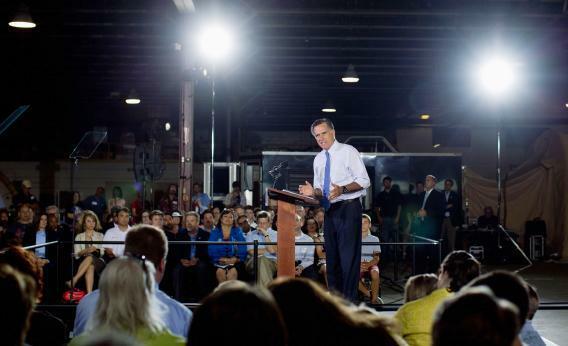 Mitt Romney speaks during a campaign event in St. Louis in June. Missouri voters might not love Romney, but the state is likely to go in the GOP column. We, in this case, are Missouri Democrats. Until 2012, nobody had ever heard of a competitive presidential election that leaves out Missouri. Missouri joined the union in 1821, and for 187 years no Democrat won the presidency without carrying the state. When Democrats lost, they at least kept it close here. Even Michael Dukakis lost Missouri by only 4 points. Then, in 2008, Barack Obama won the presidency while losing Missouri. It was close! Only 3,903 votes separated Obama from McCain, while Ralph Nader—of course, who the hell else?—snagged 17,813. Then Obama took office, and the Democrats went back into decline. In 2010, Republicans defeated Rep. Ike Skelton for a mostly rural seat that Democrats had held since before Sputnik. The red wave gave Republicans 28 of 34 state Senate seats. Justus, the first openly gay senator, was one of the few Democrats left, representing urban areas, huddling together for warmth. In 2008, the Obama campaign’s score of rural GOTV offices became a model of the hope and change candidate’s vast appeal. This year, the Obama campaign has two offices in Missouri, in the liberal nodes of Kansas City and St. Louis. Start with the demographics. In the 2000 census, Missouri was 84.9 percent white, 11.2 percent black, 2.1 percent Hispanic, and 1.1 percent Asian. Today those numbers are 80.8 percent, 11.7 percent, 3.7 percent, and 1.7 percent. It’s a slight boost to diversity, and you can see it in the vast southwest and center of the state. Park in Carthage, near the town square, and you’ll walk past a pretty bustling supermercado over to a group of antique shops and zero street traffic. But compare Missouri to a state that Obama wants to win, like Virginia. There, the population of non-Hispanic whites has fallen from 72.3 percent in 2010 to 64.5 percent today. When you talk to conservatives in rural Missouri, you hear “Kansas City” and “St. Louis” spat out like curses. (“Chicago,” too.) That’s where the crime is, and where their tax money gets wasted. But the urbanites in the state are outnumbered. Not until Obama is gone, certainly. Republicans like to refer back to a 2010 ballot initiative, nonbinding, that put Missouri on record against a health care mandate. Seventy-one percent of voters went against the administration—and, to be fair, against the idea that had been drafted originally by the Heritage Foundation. Roe’s recent polling suggests that Obamacare opposition is down, but only to the mid-50 percents, with only 30 percent of Missouri strongly behind the law. Mitt Romney isn’t somebody who hypes up conservative Missouri. He’s somebody it can tolerate. The most common phrase I heard when asking Republicans about Romney here was “he wasn’t my first choice, but …” George W. Bush and John McCain fit the Republican profile. Romney never will. Democrats, Owen and others, hear it all the time: There are conservatives who go to church, hear that Mormonism is a cult, and struggle to square that with the name on their ballot. “It hurts them quietly,” says Temple. This may be one of the states where that attitude costs Mitt Romney some votes. But it won’t be enough to let the Democrats win Missouri.